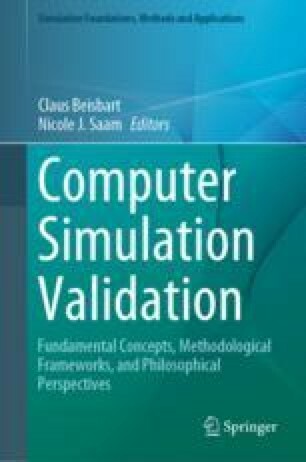 This chapter discusses the issues associated with the invalidation of computer simulation models, taking environmental science as an example. We argue that invalidation is concerned with labelling a model as not fit-for-purpose for a particular application, drawing an analogy with the Popperian idea of falsification of hypotheses and theories. Model invalidation is a good thing in that it implies that some improvements are required, either to the data, to the auxiliary relations or to the model structures being used. It is argued that as soon as epistemic uncertainties in observational data and boundary conditions are acknowledged, invalidation loses some objectivity. Some principles for model evaluation are suggested, and a number of potential techniques for model comparison and rejection are considered, including Bayesian likelihoods, implausibility and the GLUE limits of acceptability approaches. Some problems remain in applying these techniques, particularly in assessing the role of input uncertainties on fitness-for-purpose, but the approach allows for a more thoughtful and reflective consideration of model invalidation as a positive way of making progress in science. I am….an almost orthodox adherent of unorthodoxy: I hold that orthodoxy is the death of knowledge since the growth of knowledge depends entirely on the existence of disagreement. The discussions on which this paper is based were initiated while KB was supported by the Fondation Herbette as visiting professor at the University of Lausanne. We thank Claus Beisbart, Nicole Saam and an anonymous referee for their comments on an earlier draft of this chapter. Hackett, J., & Zalta, E. N. (Eds.) (2013). Roger bacon. Stanford Encyclopedia of Philosophy. https://plato.stanford.edu/archives/spr2015/entries/roger-bacon/. Mitchell, S., Beven, K. J., Freer, J., & Law, B. (2011). Processes influencing model-data mismatch in drought-stressed, fire-disturbed, eddy flux sites. JGR-Biosciences, 116. https://doi.org/10.1029/2009jg001146.